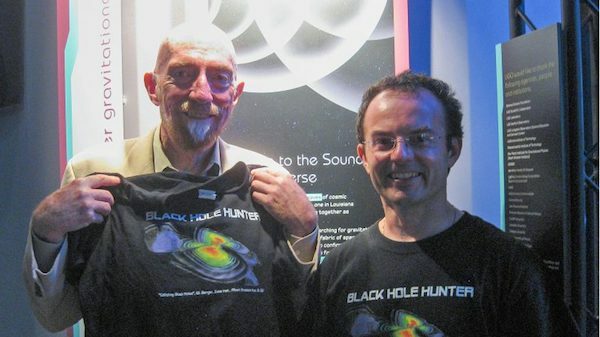 UM physics professor Marco Cavaglia, right, shares a T-shirt with Kip Thorne, one of three recipients of the 2017 Nobel Prize in physics. Submitted photo. Physics researchers at the University of Mississippi are elated over news that colleagues involved in the groundbreaking discovery of gravitational waves in 2015 were awarded the prestigious Nobel Prize in Physics Tuesday (Oct. 3). Rainer Weiss, a professor at the Massachusetts Institute of Technology, and Kip Thorne and Barry Barish, both of the California Institute of Technology, were awarded the prestigious honor for the discovery of ripples in space-time known as gravitational waves, which were predicted by Albert Einstein a century ago but had never been directly seen. “Kip and Rai are two of the most clever and kind people I ever had the honor of working with,” said Marco Cavaglià, a professor of physics and astronomy and head of the Ole Miss Laser Interferometer Gravitational-wave Observatory team. “Kip and Rai are always easy to talk with, and humble although they are among the best scientific minds of our time. Cavaglia met Weiss and Thorne more than a decade ago and credits the former for his LIGO connection. “Over 10 years ago, I was invited to LSU to give a colloquium at the physics department by Jorge Pullin, a professor at LSU working on quantum gravity,” he said. “At that time, I was working on quantum gravity, particle colliders and cosmic rays. Much to Cavaglià’s surprise, it was Weiss who gave him the tour. Other UM officials shared their reflections about the prize recipients. 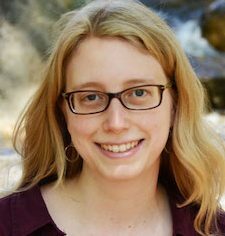 “Rai wrote the first detailed document for the design of the LIGO interferometers in 1983,” said Katherine Dooley, UM assistant professor of physics and astronomy. “We call it the ‘Bluebook’ because of how accurately he predicted all of the noise sources for the detector. Dooley worked at the LIGO Livingston site for four years, installing hardware and commissioning the full interferometer. Weiss was a regular, long-term visitor. Josh Gladden, UM interim vice chancellor of research and sponsored programs, congratulated the LIGO team on their honor. “As a physicist, the most exciting moment in my professional career was being on hand in Livingston, Louisiana, for the announcement of the first detection of gravitational waves,” Gladden said. “We are so proud of the contribution that our physics colleagues have made to the LIGO effort and that the Nobel committee has honored this discovery with the highest prize in physics. Weiss, in a live phone call with the Nobel Committee minutes after the announcement, said, “I view this more as a thing that recognizes the work of about 1,000 people,” referring to the LIGO Scientific Collaboration. “We are so pleased that our physics department and research faculty have been an integral part of LIGO since 2007,” Chancellor Jeffrey S. Vitter said. “It is quite an honor for the University of Mississippi to play a role in this international collaboration of talented scientists and engineers, which is producing such astounding breakthroughs and now the Nobel Prize in Physics. The Royal Swedish Academy of Sciences, founded in 1739, is an independent organization whose overall objective is to promote the sciences and strengthen their influence in society. The academy takes special responsibility for the natural sciences and mathematics, but works to promote the exchange of ideas between various disciplines. Nobel Prize is a registered trademark of the Nobel Foundation.